We will have Bioenergy Forum 2015 "Global trend of wood pellets and development in Japan". "European wood pellet market ―current situation and prospect of heat and power market―"
"Standardization and certification of wood fuels on EN/ISO"
"Trends and challenges of Japan's wood pellet market"
"Wood stove market and development of sealed-type FF pellet stove"
The Preparatory Meeting for Pellet Club Japan has been worked to prevail wood pellet through the workshops, business meetings, symposium, website and etc. since established in 2001. Thanks to membership's understanding and kind support, our membership has kept increasing. Now we have 364 memberships including 4 in overseas countries as of March 2004. The circumstances of wood pellet in Japan had been rapidly changed in these three years. In fact, the number of wood pellet's plant has been increasing; 3 plants started their operation in 2002, 6 in 2003 and 2 in 2004. Production and sale of combustion appliances are also being in plentitude; there are 10 manufacturers and 7 importers of pellet stove, 2 manufacturers and 2 importers of pellet burner and 2 manufacturers and 3 importers of pellet boiler. However, when we see the current situation of distribution and sale here in Japan, it can be found we're still in strict situation. Reinforcement of infrastructure and setting up the standardization for distributing wood pellet are required. Also, to make a coalition not as an individual manufacturer but as the trade and to make wood pellet's market grow are required for providing the information and dealing with troubles of customers which keep increasing, and deregulation. We think it is essential to make a network with NGOs/NPOs, works on woody biomass and emerges one after another throughout Japan, and to exchange the information with each other for that woody biomass become permanently established in Japan not as a mere boom. In our symposium on March 5th, as well as verifying the contents and meaning of our activities, we declared dissolution of the Preparatory Meeting for Pellet Club Japan. 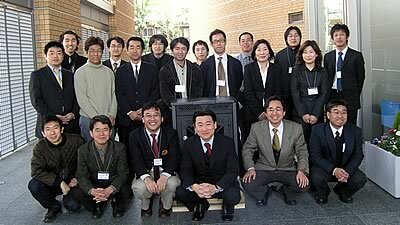 Also, we announced establishment of "Pellet Club Japan" in the General Meeting 2003 on March 6. 3-years preparatory term to discuss about "how Pellet Club Japan should be?" with deliberating the Japan's failure 20 years ago and listening to internal and external opinions is over. From April 2004, we will start to work more actively as a newborn "Pellet Club Japan". It would be greatly appreciated if we have your continuous understanding and support for our activities. But the using system of bioenergy has not promoted in Japan yet. Total amount of returned lye, waste timbers, biomass power accounts for only about 0.8% of primary energy supply (as of 1999)*1. Information is maldistributed and too much technical: it is difficult to understand. Equipments are large in comparison with fossil fuel's: it is difficult to deal with. Position in energy policy is vague: the risk of primary investment is high. Formation of the market is delayed: it is difficult for the industries, citizen, and public administrations to start to work. But the Government shows their intention to introduce the using system of bioenergy positively in Japan in the near future*1. In such case, ordinary direct combustion will be mainly introduced with consideration of the degree of maturity of Japan's bioenergy technology. Direct combustion of biomass can generate both heat and electricity. But in view of our daily life, small-scale heating in residential and commercial buildings seems the most effective way to use bioenergy in medium and long term. Japan Center for Climate Change Actions (JCCCA) and Woody Biomass Forum think that the using system of wood pellet fuel is beneficial, as local people can work on from grassroots level and the technology is applicable to small-scale heating, without generating electricity. To promote to prevail wood pellet throughout Japan, we have held successive workshop since May 15, 2001. We think that enlivening activities at local level and building a network for prevailing wood pellet fuel by holding successive events are significant to use bioenergy - an energy source with regionality. The objective of building a network is to exchange correct information to prevail wood pellet fuel. We would think it would be possible that the using system of wood pellet fuel is adequately introduced in Japan's society by collecting maldistributed information and opening them to the public. Pellet Club Japan doesn't aim to be an industrial group like pellet producer, maker of pellet production machine and maker of pellet burner. Pellet Club Japan is a non-governmental organization which mainly aims to promote sharing and providing information as a clearinghouse and getting bring agreements among citizen, local authorities and industries that are interested in wood pellet. The information and all of our studies will be open to anyone who is interested in wood pellet. The organization's name is "Pellet Club Japan". The preparatory meeting for Pellet Club Japan aims to prepare for establishing "Pellet Club Japan (provisional name)", which is a network to prevail production, distribution and consumption of wood pellet fuel. Membership of the preparatory meeting for Pellet Club Japan consists of individuals and groups that agree with its aim. In addition to an annual general meeting, board members and secretary-general can decide to hold another general meeting in the same year. Also, in case majority of membership demands, general meeting has to be held. Matters to be decided to establish "Pellet Club Japan (provisional name)"
Copyright (c) Pellet Club Japan All rights Reserved.